Richard Parker delivers a provocative and eye-opening look at the most explosive and controversial state in America, where everything is bigger, bolder-and is shaping the future of America. Americans today are reckoning with a new Texas-that love-it-or-hate-it giant slice of America that has sparked controversy, bred presidents, and fomented change from the Civil War to the election of George W. Bush and the Iraq War. In LONE STAR NATION, Parker examines this evolving landscape. But the Texas that Americans think they know is changing, and as a result it will change America itself in the twenty-first century, just as California did in the last century. 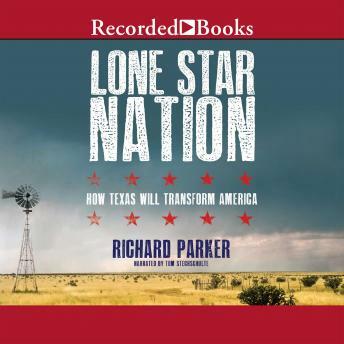 Richard Parker uncovers a new Texas: a profoundly urban one, an overwhelmingly Hispanic one, an increasingly liberal one, and one succeeding in the global economy while being forced to face the looming threats of poverty and climate change-and sooner rather than later. He explores the broader implications of change in Texas that could help remake Washington and energize the American economy. Along the way, he shares the stories of the powerful and everyday people that are shaping Texas and, as a result, the country itself, as one in every five Americans will soon call Texas something else: Home. Richard Parker is an award-winning journalist who writes about political, economic, technological and social change. His work appears in the Op-Ed and Sunday Review sections of the New York Times, the Columbia Journalism Review and other major newspapers. He lives in the Texas hill country outside Austin.